control for your business, home or event. Sun exposure, number of windows, type of building (or tent), amount of insulation, number of people, and computer heat load. Keep in mind that a portable air conditioner with too little cooling power will not cool your space adequately, while a portable air conditioner with too much power will short cycle (constantly turn on and off), which can burn up the compressor, and not dehumidify your space well at all. Condensate Disposal. 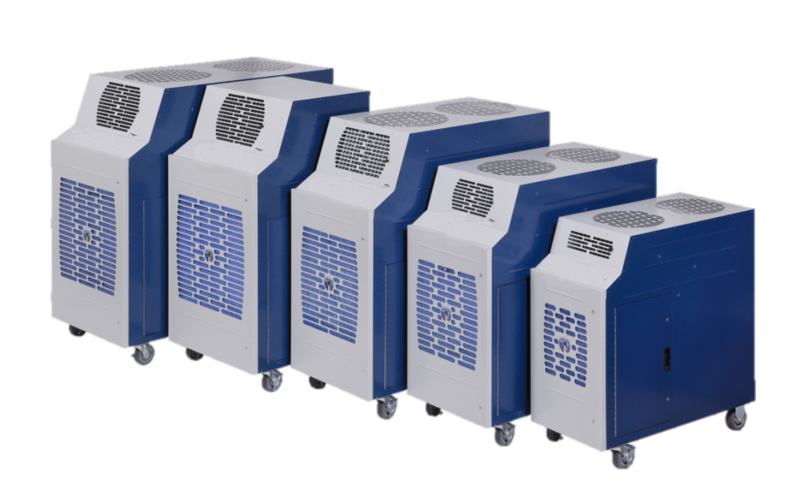 All portable air conditioners dehumidify the air that passes through them. The water removed from the air is called condensate. Portable air conditioners contain a removable bucket that fills up with condensation sometimes relatively quickly (every 4-8 hours, depending on humidity level) and must be emptied/dumped by hand. One option is to remove the bucket and replace it with a condensate pump. The physical pump resides inside a small reservoir that fills with condensate. When the pump float switch triggers, the motor turns on and pumps the condensate (water) out of a flexible plastic hose. The hose is typically routed to a sink drain somewhere away from the unit. NOTE: Most pumps come with a high water shutoff switch. If the pump stops operating, a second switch inside the reservoir trips when the water level becomes too high and shuts off the unit or compressor. Hot Air Exhaust Duct. 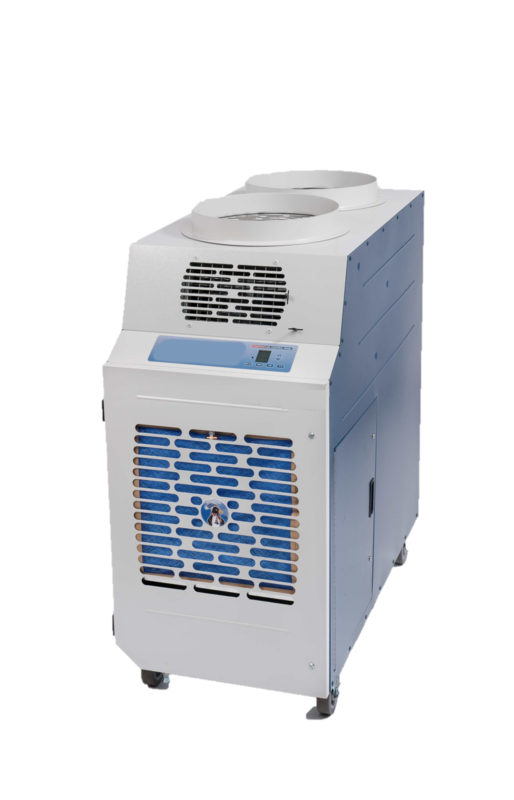 All “air-cooled” portable air conditioners must exhaust the heat from the units condenser away from the air conditioned space. 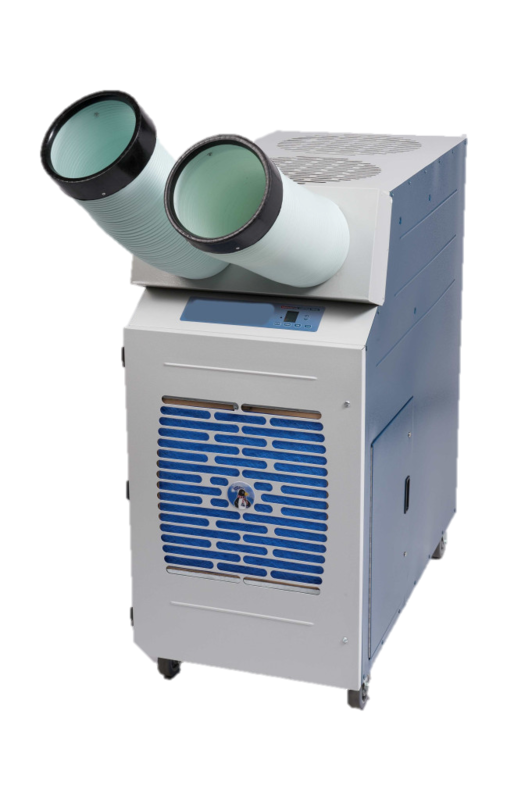 Most portable air conditioners use a flexible exhaust duct connected to the portable air conditioner on one end. The other end is typically connected to a 2′ x 2′ ceiling panel that replaces the existing ceiling tile. The hot air exhausts into the open ceiling plenum. The plenum is the space above the ceiling. What type of power outlet do you have within 25 feet of where you want to place the unit? 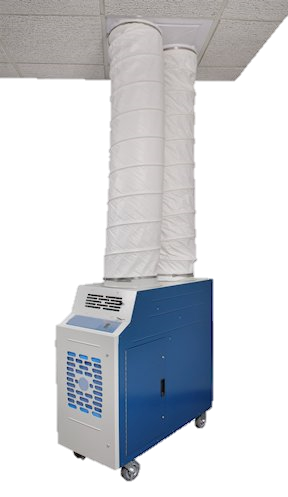 All air-cooled units require a hot air exhaust duct to remove the hot air from the space you are trying to cool. Most spot coolers come with a 5 gallon tank that gets filled with condensation up to twice/day.